This break-through broad-spectrum medication treats parasitic, bacterial, and fungal infections. MinnFinn is the easiest treatment on the market to use. Treatment time is only one hour and no water changes are needed when you are done. NeuFinn is required with MinnFinn, Neufinn neutralizes and stops the treatment process, returning your pond's water chemistry back to its original levels. A slight elevation in oxygen levels may accrue. This will end the treatment quickly when necessary, giving you a safety buffer. 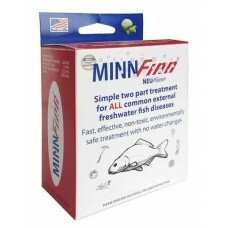 MinnFinn is a treatment for a number of organisms found living on the outside of your fish. 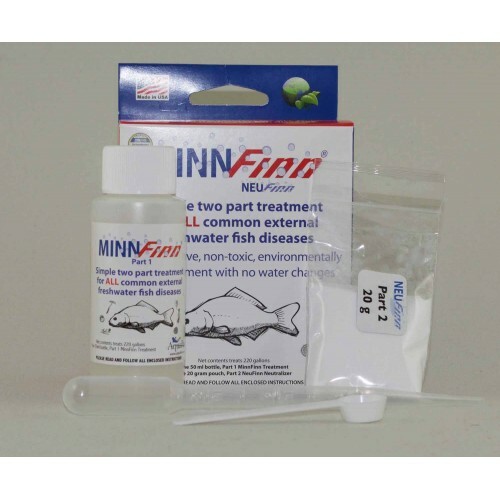 MinnFinn eliminates PROTOZOA parasites, FLUKES and many external BACTERIAL infections infections.MinnFinn is Neutralizable, so the treatment is ended immediately with the application of NeuFinn. Once neutralized the ponds environment will return to normal. MinnFinn is safe to discharge directly into open water bodies. It is registered with the EPA. MinnFinn is the most effective yet environmentally friendly therapy on the market today. The technology MinnFinn® is based on disinfection technology used in the healthcare, medical and biotechnology industry. Unlike other treatments which can cause microbial resistance, MinnFinn® breaks apart the cell walls and membranes of microbes, making it the most effective treatment on the market. MinnFinn Koi pond treatment is one of the only environmentally friendly treatment medications.